How much of India's recent history - like the anti-Sikh riots of 1984 - does the country's youth understand? And how do they see their future? These are some of the questions that Shonali Bose's recently released, first feature film, 'Amu', puts up to its audience. The Internet today has an extensive account of the anti-Sikh riots that occurred in Delhi the first three days of November 1984, following the assassination of Indira Gandhi. Besides a chronological account of the events, there are sites that offer a number of case studies. Some of these are set in the Trilokpuri basti (slum) which, along with Mongolpuri and Sultanpuri was among the worst affected areas. The stories on the net are both sickening and frightening. "The method of killing," states one, "was invariably the same: a man was hit on the head, sometimes his skull broken, kerosene poured over him and set on fire. Before being burnt, some had their eyes gouged out. Sometimes, when a burning man asked for water, a man urinated on his mouth." It is in Trilokpuri, 20 years after the fact, that director Shonali Bose has located 'Amu'. As it first appears on screen, the basti seems familiar, even anodyne, with its groups of excitable children, perennial water and electricity shortage, and gossiping neighbours. 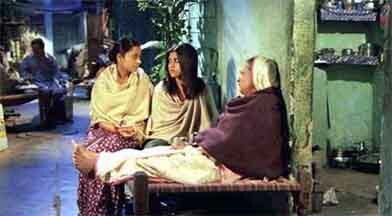 Kaju, the film's protagonist (played by Konkona Sensharma), visits Trilokpuri because of a randomly struck friendship with Chandan Bhaiyya, who runs a dhaba (a roadside caf') in Delhi University. The adopted daughter of a Bengali mother, Kaju has lived in the US since she was three years old. And she has been told that her birth parents died of a disease that wiped out the entire population of their village. Kaju has come to India, armed with the ubiquitous video camera, to discover her roots. She lives with her extended family in Chittranjan Park, and gets romantically involved with Kabir, a college friend of her cousin. The only son of a senior bureaucrat, Kabir is initially sceptical of what he calls Kaju's "foreign lens", but soon becomes involved in the mystery of her origins. Not only does he help her find the truth about her parents (her father and brother were murdered by rioters and her mother committed suicide); he also discovers some truths about his own father's culpability in the 1984 riots. "I chose young people as my protagonists," says Bose, "precisely because they have to confront these things and move on. They are the hope and they cannot give up. My protagonists had that courage, grit and determination to find out the terrible truth. This is what is important: the youth today cannot have amnesia about the poor, about the problems that exist around them because it will catch up with them; and their future is not something rosy that can be separated from all these things." In the film, there is a scene when Kaju tells Kabir that she doesn't want to know what happened, but can't help herself. Later, when Kaju suspects that her real father may be a drunken auto driver who participated in the riots, Kabir (himself now rebelling against his father's understanding of the world) comforts her by arguing that they are separate from the lives and actions of their fathers. The relative "rosy-ness" of many young Indians is also addressed through another seemingly minor facet of 'Amu'. Each time Kaju the NRI is polite to the maid, Bela (saying "please" for example, or offering to make the bed herself), her cousin Tuki looks both incredulous and exasperated. According to Bose, "Class issues are acutely observed by those who have grown up outside India, though for the upper and middle class here they are taken for granted. But after living in India for a while, everyone adapts to the reality of 'being served'." In this sense, 'Amu' challenges the Indian youth to dig deeper into the causes of the discrepancies that surround them. To understand that no matter how corrupt and stifling the systems of their governments and society might be, apathy and cynicism (as portrayed by both Kabir and Tuki) are not the only valid reactions. "This is why the censor certificate of A (for the film) particularly incensed me," says Bose, "This film must be seen by young people. In fact 11- and 12-year-olds who have watched it in private screenings have really been gripped by the film, and they asked the most piercing questions." It is difficult to say, however, how many young people have seen the film. According to Ali Abbas Zafar, who worked on 'Amu' in various capacities from designing sets to managing distribution, not many college students have seen the film in Delhi, primarily because only one print was released in the city. For Sakya and Sanah, two students - from Venkateshwara College and the Institute for Integrated Learning and Management (IILM) respectively - who have seen 'Amu', the film hasn't been publicised enough. In their view, the publicity has focussed on Kaju, instead of the riots. Zafar says this was a deliberate decision, to posit the film as a "wound healer" rather than a "cash-in" on 1984. Instead of mass publicity, 'Amu' has relied on word of mouth, with positive results. The film is playing to near-full houses in Bombay, Kolkata, and Delhi, where a second print is to be released. And it will be screened in Chandigarh in February 2005. Instead of sensationalising the riots, the filmmakers have chosen to conduct 'Question and Answer sessions' at cinema halls across the country. These have elicited questions, congratulations, anger (at the injustice), and even offers to subsidise the dubbing of 'Amu' into Hindi. If all goes well, says Zafar, the film should be dubbed and ready for re-release in June 2005. That kind of mass release may see the real test of 'Amu'. As Sakya points out, its audience now, at least in Delhi, is limited to those (among the students) who are already familiar with the history of 1984. Those whose 'rosy' outlook Bose has tried to tint with shades of grey seem missing, at least in Delhi. Why is this so? Sakya says that many of his contemporaries are "reluctant to try anything new". Or maybe, adds Sanah, they feel that "nothing can be done about it (justice for riot victims, corrupt politicians)." However, it is clear that by talking to young women and men, films like 'Amu', 'Kaya Taran', 'Khamosh Pani' and 'Black Friday' (now stuck in the Bombay High Court), are seeking to challenge apathy, cynicism and despair. In this sense, such films are not merely necessary - they hold the potential of contributing to significant change.